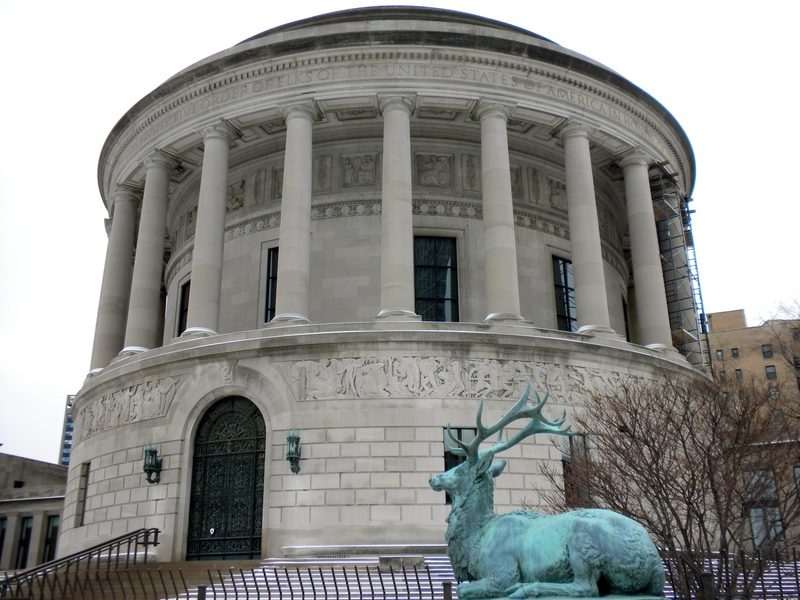 When Chicagoans walk or drive past the stately Indiana limestone building located just a half mile west of Lake Michigan in the Lincoln Park neighborhood, they might wonder why the building is guarded by a pair of identical life-sized bronze elk. 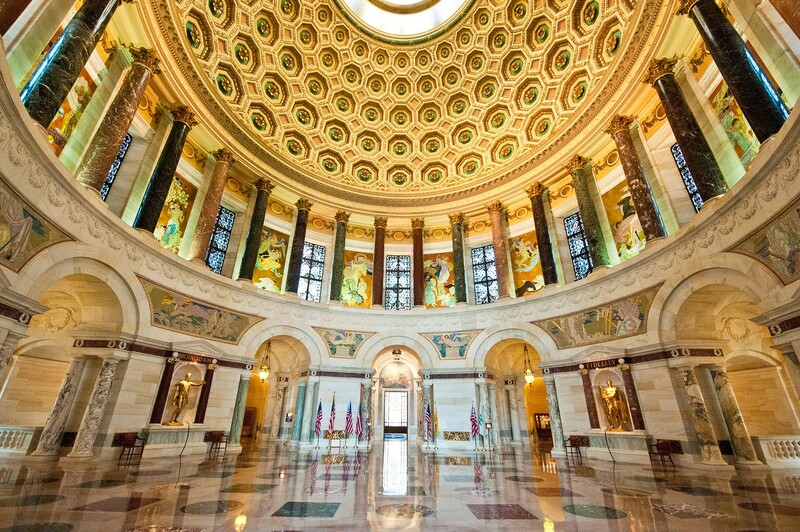 Little do they know that inside this circular building is one of the finest natural stone installations in the United States, featuring over twenty-seven varieties of marble. Historic photo of the Elks National Memorial Headquarters Building. The Elks National Memorial Headquarters Building was commissioned by the Benevolent and Protective Order of the Elks, one of the oldest and largest fraternal organizations in the United States, and dedicated to the memory of Elks who served in World War I. The monumental building, built in the classical Beaux-Arts style and based on the aesthetic and architectural design principles taught at the École des Beaux-Arts in Paris, was completed in 1926 and designed by Egerton Swartwout, best known for his work on monumental buildings and memorials, including the Missouri State Capitol. 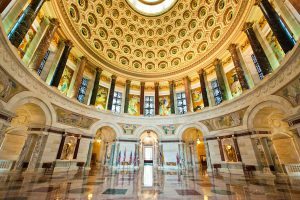 We often focus on new buildings or remodeling projects and how to incorporate natural stone into the designs, but rarely do we pause to consider the beauty of structures that have withstood the test of time. 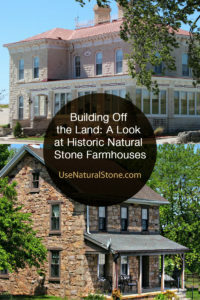 Revisiting nearly century-old structures is a great reminder of natural stone’s sustainability and longevity. From the outside, the building looks dramatic and impressive. Walk through a 20-foot-high single arched bronze doorway and be ready for a visual feast. 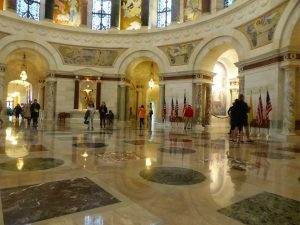 While many parts of the interior are of note, the crown jewel is Memorial Hall, which serves both the building’s main interior space and architectural focal point. The ground floor of Memorial Hall. Photo courtesy of Megy Karydes. 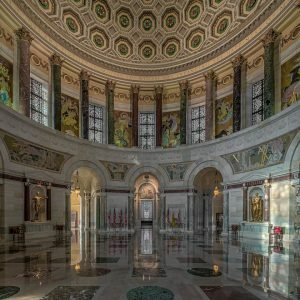 Memorial Hall soars to the total height of the building at 100 feet and the gilded dome above is remarkable, as is the marble found throughout the room, literally from top to bottom. 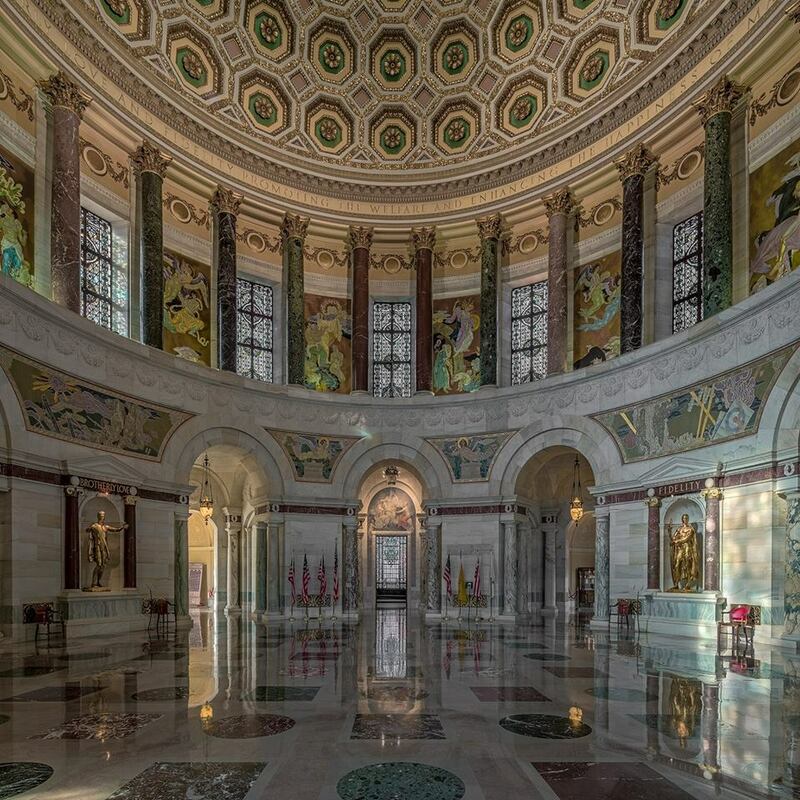 The space incorporates 27 varieties of marble and the National Association of Marble Dealers considered it “one of the finest marble installations in the United States” in a story about the building in its August 1926 trade magazine, Through the Ages. From the marble floor to the second tier columns above as well as the 48 columns encircling the room and supporting the balcony, it’s like a showroom dedicated to marble from around the world. 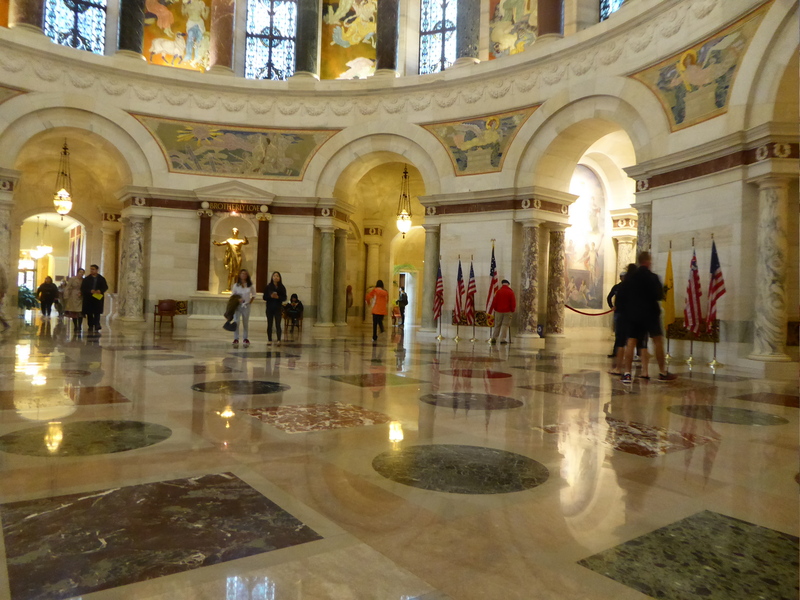 27 varieties of marble, as seen in the Memorial Hall. Sourcing the marble for such a massive space was no small feat. 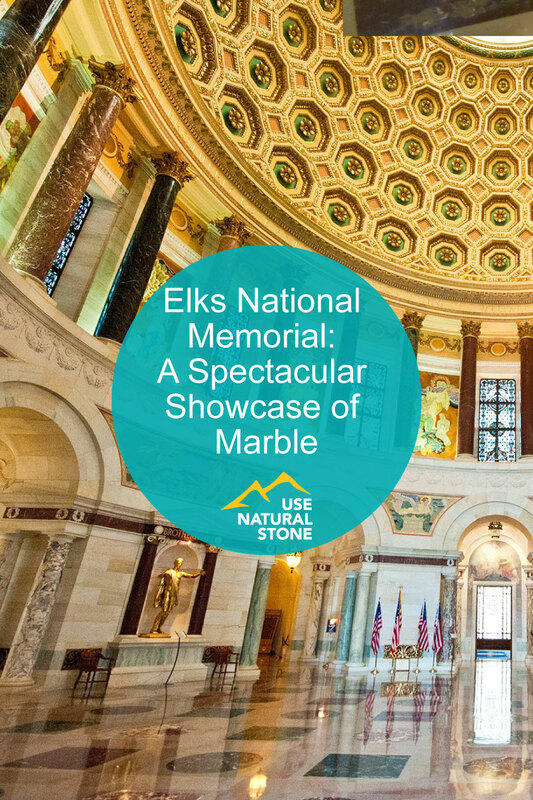 A year and a half was spent securing, selecting and preparing all of the colored marbles used in Elks Memorial and the marble alone cost $578,000, according to the National Association of Marble Dealers 1926 article. 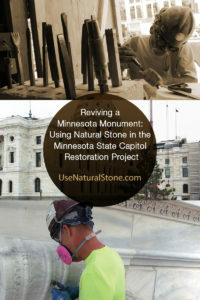 Yet, despite the size of the marble contract for this project, one mill handled the whole job. At the time of its construction, few circular buildings had been built, save for the Pantheon in Rome and some smaller temples. 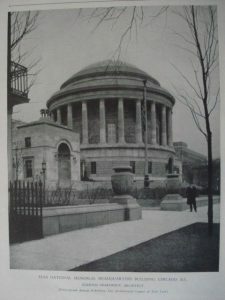 “Because of the circular design, construction of the Memorial Hall was particularly difficult and called for extreme care, since all masonry, all brick and stone work had to be laid on a radius. 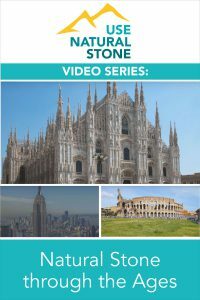 Almost every piece of stone has a curved surface. The size of each piece was worked out, in advance, on the drawings, and each piece was numbered to correspond with its numbers on the plans. The manufacturing plant, at Carthage, Mo., where the stone was cut and finished, made every piece to fit into the mosaic as a whole, a job requiring the strictest accuracy,” according to The Elks Magazine article from July 1926. 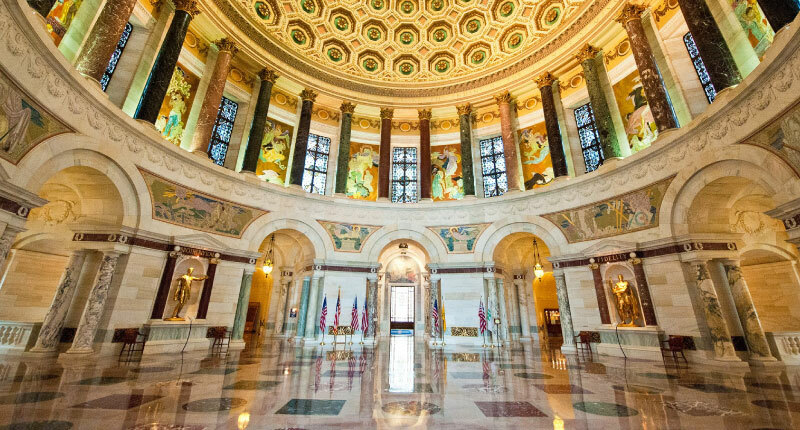 The Elks National Memorial Headquarters Building may originally been dedicated to those who served in World War I but it’s since been re-dedicated to honor all American veterans serving in all later wars and conflicts. An enduring war memorial, it continues to exemplify fine craftsmanship with its use of luxurious building materials including limestone, marble, and bronze.